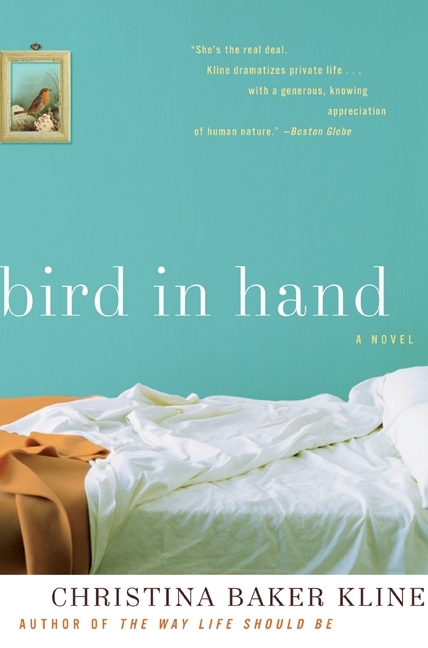 Bird in Hand is about an accident that sets in motion a chain of events that changes the lives of four people. I wrote about it here often; to see more, select the category “Bird in Hand” on my home page. Here are some recent reviews and a brief description. For even more, check out my website or the very good site for Bird in Hand created by some talented people at HarperCollins. There’s a reading group guide here. The book will be available in paperback in June 2010! 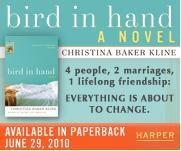 BIRD IN HAND: Four people, two marriages, one lifelong friendship: everything is about to change. It was an accident. It was dark, it was raining, Alison had only had two drinks. And the other car ran the stop sign. But Alison finds herself trapped under the crushing weight of grief and guilt, feeling increasingly estranged from her husband, Charlie, who has his own burdens. He’s in a job he doesn’t love so that Alison can stay at home with the kids (and why isn’t she more grateful for that? ); he has a house in the suburbs and a long commute to and from the city. And the only thing he can focus on these days is his secret, sudden affair with Claire, Alison’s best friend. Bold where Alison is reserved, vibrant where Alison is cautious, Claire has just had her first novel published, a thinly veiled retelling of her childhood in North Carolina. But even in the whirlwind of publication, Claire can’t stop wondering if she should leave her husband, Ben, an ambitious architect who is brilliant, kind, and meticulous. And who wants nothing more than a baby, or two; exactly the kind of life that Charlie and Alison seem to have. In each of her novels, Christina Baker Kline has explored how people tell the stories of their lives and what those stories reveal about who they are. As they set out on their individual journeys, Alison, Charlie, Claire, and Ben explore the idea – each in his or her own way – that every moment of loss contains within it the possibility of a new life. Alternating through these four intertwined perspectives, Bird in Hand is a searing novel about friendship, love, marriage, loss, and the choices we make that irrevocably alter everything we believe to be true. and I like that cover! Bird in Hand sounds like an interesting book. That’s great. Do let me know what she thinks of the book! Your site — and ideas — are fascinating. Thanks so much for letting me know about it! I have finally finished reading your novel in recent days. I feel your piece is good for everyone in the marriage town. As a Chinese person I have gotten a lot from your work. Thank you.